Hello! Thanks to the roomate who wakes me up precisely at 5 a.m or else I miss my Suhoor. Somehow weird that I feel very hungry and ready to have a coffee, some biscuits and dates. Then I relaxed a bit and had a little nap on the table. After some procrastination, I do my Subuh prayer and some laundry. Then go back to sleep as my eyes weighed tons. Later I woke up and head out to the mall with some friends. 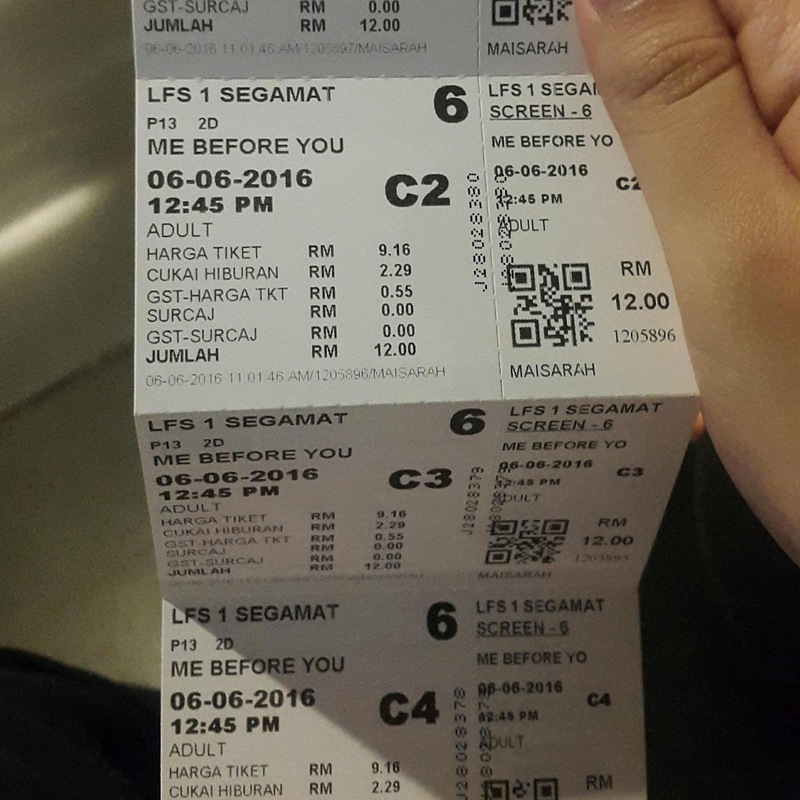 We went to watch a movie, its Me Before You and I quite like it and not much on the ending. I did a little shopping too and I actually promise to myself not to buy anything for a month but I couldn't resist and bought this one scarf. Its very affordable that I couldn't pass it up. Then broke our fast at Pizza Hut which is alright and somewhat fun. I said alright because we sat there for two hours untill the time to break fast. No one's fault it is just that we went there a little too early. Very tiring as we've been out all day. Morning class tomorrow. Hoping for a better day and less negativity tomorrow. Ramadan Kareem to all Muslims. Just a photo of the movie ticket earlier.